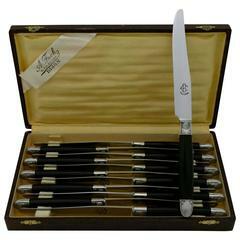 This service includes twelve dinner knives with Art Deco decoration. Horn handles, silver ferrules and collars. The stainless steel blades bear the mark "As de Trefle" for the cutlery manufacturer Pierre Astier, a guarantee of quality. No monograms. Prestigious master cutler: Pierre Astier Avenue Pierre Guérin, Thiers active May 16, 1940. Thiers, in Auvergne, is the French capital of cutlery since the middle ages. Knife manufacturers are keen to highlight their expertise by offering products of the highest quality. The search for perfection is a culture, an inheritance and a state of mind Measures: 9.84 (25.3 cm) dinner knives Weight: 582 grams. The condition is very good for this set. no crack, no lack or repair on horn parts. Micro-scratches from normal use. A master cutler made a complete cleaning and polishing, all have a fine luster. Shipping & Insurance Information : Sales only by shipment. SHIPPING WORLDWIDE with Priority Package Express International We ship purchase Mondays through Friday ( outside french holidays ) paid items will be shipped on the first shipping day after payment is received. After registration of your order and confirmation of your payment, your order is prepared and packaged with the utmost care to ensure you receive the items in perfect condition. Your package will be insured for the total value of your purchase (s). Tracking numbers (French and international) of your package will be sent by e mail to track your package online on the french website then on the website of postal service in your country. The condition is very good for this set. no crack, no lack or repair on horn parts. Micro-scratches from normal use. A master cutler made a complete cleaning and polishing, all have a fine luster.